Oxford—With its beveled, small format wall tiles, and dramatic floor / wall mosaic, this sophisticated line creates transforming three-dimensional effects. Divine Woods—Intricately textured, these 13” strips display a natural wood-grained background topped with bas relief-like designs that immediately capture attention and refine any wall. 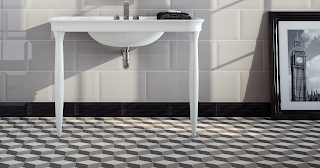 For more information about these lines, please follow the links to Marazzi's website.